An elegant, medium-sized cat tree with 2 cosy dens and 2 very comfortable, padded platforms made from natural hand-woven material. Long lasting, good looking and much loved :"My cats have used this for five years. The heavy Tonkinese and lighter Devon Rex attack it daily - the smallest perches right on top, scratching the 'roof' several times a day, but it has survived. A"
Banana leaf - a rediscovered natural material; in many cultures, this material is an important part of everyday life. 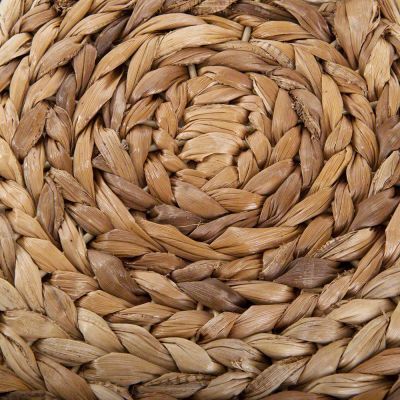 Woven together by hand to create elaborate and beautiful scratching furniture, banana leaves embody nature in a unique way. The unique character of this natural material gives Banana Leaf furniture a special aesthetic character that appeals to animals and humans alike, offering a feeling of both security and relaxation. 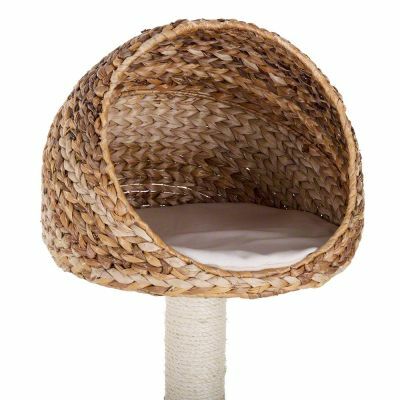 Round and elegant, warm and natural, these lovely cat trees add a touch of luxury to your home. 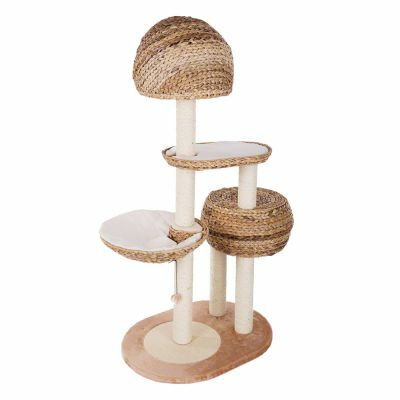 The Karlie Banana-Leaf Cat Tree Paradise is truly a paradise for cats! The lower den has a smaller opening, making it the perfect place to hide, especially if your cat wants to retreat from other cats. The upper den has a wider opening for a great view. Both open platforms and the roof of the lower den offer plenty of space for lounging, playing, and jumping around. 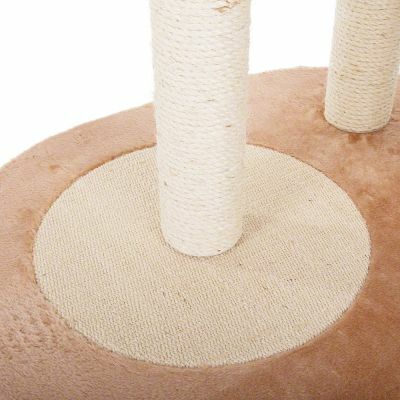 The durable, robust scratching posts provide your cat with the perfect place to scratch to its heart's delight! And the bobbling ball toy is irresistible to your cat. The included cushions can be washed up to 30 degrees C.
Note: As with any other product, please check regularly for any damage, loose joints or screws and replace the item if it is damaged or defective to avoid potential injury to your pet. My cats have used this for five years. The heavy Tonkinese and lighter Devon Rex attack it daily - the smallest perches right on top, scratching the 'roof' several times a day, but it has survived. 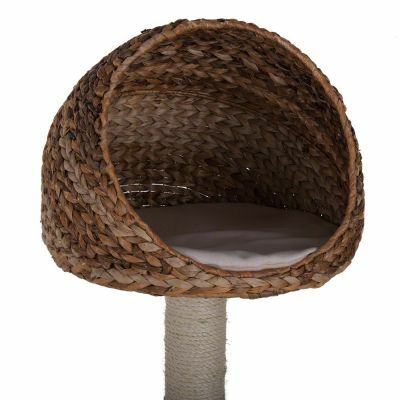 All take turns in the top cave, basket, scratching posts.. They love the view the height gives - favourite place for sunshine and snoozes. Excellent condition despite 5 years of daily attack. Don't yet need another but would not hesitate - solid, lasts, handsome. I have had this tree for over 2 yrs and an very happy with it. 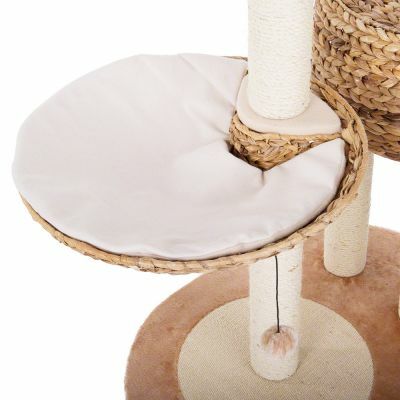 It is sturdy and perfect for my 4 cats. Was ok putting together but well worth the time. After just a few months we came home to find this in pieces on the floor. We have two lazy BSH and a Tonkinese all indoor cats. We are elderly and this was a lot of money for us. We are so very disappointed. 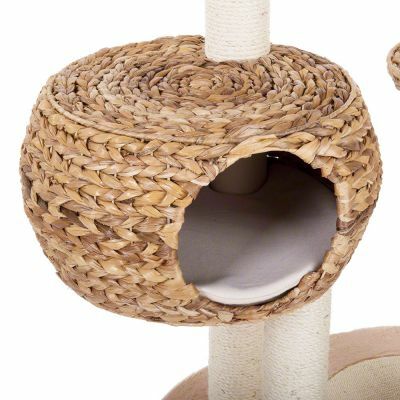 My cats love it but nightmare to construct! This is my second Cat tree. Great for my two cats. But difficult to put together because the smaller connecting bolts are not long enough to easily meet the connecting pieces. After a lot of bad language and brute force I was successful. I also used one item from previous model which connected more easily as I ran out of steam. If the smaller bolts were actually long enough to reach pieces it would have been easy to put together. But my cats love it so it was just about worth the effort. I'm surprised more people haven't mentioned the size of the bolts they supply to put this together. If you rely solely on these then I think you're going to find it impossible to put together and if you do manage its not going to be tight enough. Luckily I had some spare from previous trees which fit. Overall now it's up it does look great. The cats like it and the cushions are easy to take off and wash which is another plus. Overall not as solid as I'd expect for the price but time will tell! Used by 2 tonkinese, one asian, heavy boys. Assembly took a bit of head scratching but no issues. Very robust - three large cats squeezed into the one basket without any problems, it never rocks or tips. The top basket can be pivoted to give the best 'view'. I've moved this up and down stairs a few times; it is solid. After a year the foam inside the cushions started to crumble, so I replaced with fabric. Love the washable the cushion covers. A great buy. Still Wonderful 27 kittens later! This cat tree is sturdy, long lasting, and well loved. I breed rag dolls, with about 1 or 2 litters a year, and three adult cats, and random visiting cats! After five litters and three years, this cat tree still almost looks brand new. I was just checking to see if it was for sale as my clients wanted to know. It is fabulous - the big cats love the shelves and top sections while the kittens love the cave. Love it soooo much! This cat tree was popular when I bought it 20 months ago - three large boys squeezed into the curved bed together. It is very sturdy, withstanding heavy cats leaping on and off. I have moved it from room to room, up and downstairs, and it is very robust. Currently in my bedroom and the current three cats all use it to look out the window or tuck away for a peaceful nap. They scratch the posts daily, sparing bedroom furniture. And it still looks good! We've had this tree for almost 5 years andit still looks like new. It's sturdi enough for our cat to jump on it when playing and run up to the top. Our cat loves it! It also looks great - we even get complements from people who don't have cats! I would definitely buy another one if this one needs replacement (although it looks like it will last for years to come). This really is a very attractive cat tree once we actually managed, with great difficulty because of very poor instructions, to build it. Unfortunately, because I have 2 large Ragdolls, it was not sturdy enough for them. When they jumped on it the whole thing wobbled so much it terrified them and we had to dismantle it and return it. Zooplus did not quibble and I got the tree uplifted and money returned within days. Excellent service as always. Very nice tree in the end, however, took hours to build as instructions were very misleading and screws are too small, the tree being so difficult resulted in it because wobbly but it's fine once the cats are on it. We ve had this now for 6+ years and it's been great. Very sturdy and stable we have had 2 ragdoll cats now 6 yrs old ( one of them died earlier this year) and now have 2 7 month old kittens. All of them love it. The older one uses the top to jump up onto high cupboards so she has some space. The other two share it. We will need to replace it in the next 6 months as it is now showing signs of wear mainly with 2 energetic kittens added to the mix, will buy the same again, can t fault it. 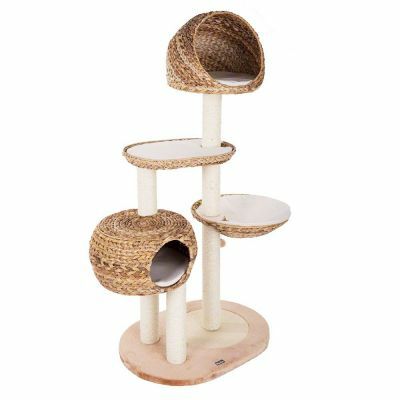 Firstly I love the look of this cat tree but.....it took me hours to figure out from the "plans" how to put it together. I have since, this morning put it together and taken it down three times as no matter what I do it wobbles. My cat jumped up to the top basket and it moved so much he jumped straight out. YouTube video I found didn't really help much If anyone has any tips I would be glad of them because if I can't sort it I will have to reluctantly return it. Do NOT buy this product! Rubbish! 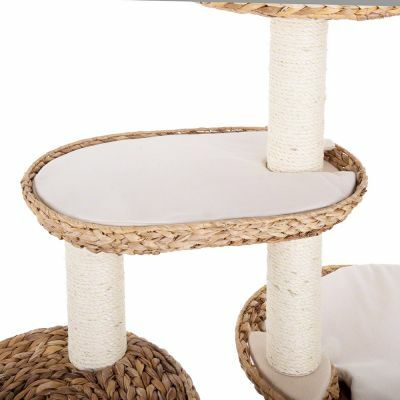 I was so excited to receive this product, as we've had the same cat tree for our two cats since they were kittens. 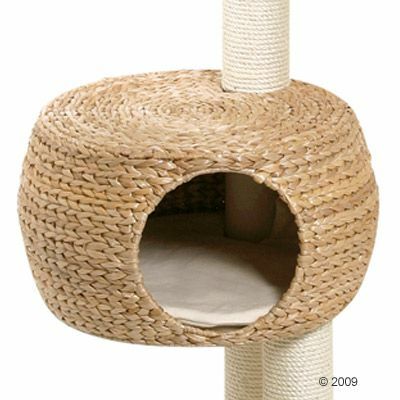 The reviews looked great and the customer pictures of the cat tree on here looked fantastic. When I unwrapped everything and tried to assemble it, I was already stumped at step 1 as the 3 X "Q" screws are too short and you can't attach part "K" to part "B." The next part where you have to use a "Q" screw, in step 4 it's also too short again! By leaving these two steps unscrewed the cat tree is completely not fit for purpose as it wobbles all over the place. My cats wouldn't even go near it! I called Zooplus who were helpful and suggested I try and source three more "P" screws as these might be long enough to do the job. I've tried three hardware stores and none of them have stocked screws of this size so I'm reluctantly having to send the tree back for a refund. Such a shame and judging by looking back at the reviews, several other people have found these screws too short. Not sure how they've overcome the problem as it is so unstable without being able to screw these screws in properly. A shame.